Ladies this Thursday, September 20th from 5 pm to 8 pm grab your BFFs, co-workers, family members and head downtown for our second annual Girls’ Night Out! There will be over 30 downtown retailers participating in the event that will treat you to in-store special prizes, free tastings and more! At 5 pm the Sipping Garden opens in front of the courthouse on the 1300 block of Pearl with a DJ, cash bar and giveaways! Goodie bags will be provided for the first 150 ladies who enter the Sipping Garden! I helped stuff the goodie bags and assure you that you don’t want to miss out! I wanted to highlight some of the in-store events you don’t want to miss! Stop by Adorned for goodie bags, 10% off everything in the store, tarot card readings, as well as psychic readings. While on the West End check out a special trunk show at Fjallraven with Anita Gronstedt who will be displaying and selling her handmade sami bracelets during the event. Come hear Chris Ruiz perform live and enjoy a variety of light refreshments. Zeal Optics is located one block north of the mall on Spruce. Zeal Optics is hosting a free yoga class from 6:30 to 7:30 pm with Brew Dr. Kombucha drinks being served! There is a $75 gift card at the Sipping Garden available to one of the first five lucky shopper who spends $100 or more at any retailer participating in the event and brings their receipt back to the Sipping Garden! Momentum will be hosting a beautiful and unique trunk show featuring Global Girlfriend and one lucky goodie bag from the Sipping Garden will have a $25 gift card in it so make sure you are one of the first 150 event attendees that enter the Sipping Garden starting at 5 pm! Head on down to Savvy on Pearl for all your Fall wardrobe necessities! Savvy will be giving 20% off all new Fall clothing as well as 15% off boots like Sorels and Toms. Linda Faul will be doing a live oil paint, and you also have the opportunity to be entered in a drawing to win one of six Savvy on Pearl gift cards. Light snacks and refreshments will be provided. ONE lucky person will receive a free Colorado T-shirt from Savvy! 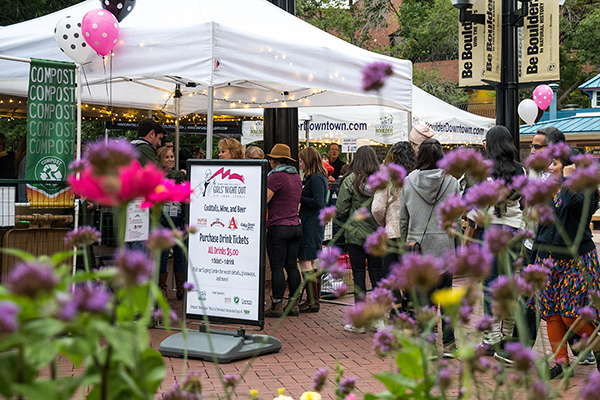 The first five ladies to spend $100 or more during Girls’ Night Out at participating businesses and bring their receipts back to the Sipping Garden will then have the chance to win HUGE prizes at the Sipping Garden. The first five women to spend $100+ DURING GNO (starting at 5 p.m.) at any of the participating GNO retailers and return to the Sipping Garden with their receipt(s) will have the chance to win one of the following: $100 Barbara & Company Gift Card, $75 Zeal Optics Gift Card, stylish hand bag from Jones + Co. Mercantile, necklace from Adorned or a pair of Fjallraven Abisko Trekking Tights. Anyone who brings a receipt of $50 or more from any of the participating GNO retailers back to the Sipping Garden will receive a drink of your choice. Other retailers participating in this event with other awesome in-store deals and events are: Art + Soul Gallery, Athleta, Blo Blow Dry Bar, Buffalo Exchange, Bulldog Yoga, Common Era, Elison Rd., Fabricate, Freebird Stores, Fresh Produce, Go Far, Goorin Bros. Hat Shop, Island Farm, Mountain Standard, Nani Nalu Beachwear Boutique, Pedestrian Shops, PrAna, Ramble on Pearl, Red Fox, Sherpani, Topo Designs, Violette, Weekends and MudBuM. For a complete list of in-store events as well as times and participating retailers visit GirlsNightDowntown.com for more information! We can’t wait to see you all this Thursday & lets enjoy some much needed retail therapy!